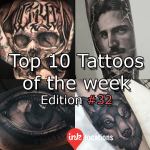 Welcome to the thirty-seventh edition of InkLocation’s Top 10 Tattoos of the week. Seems like it’s week of the skull tattoos! Featuring Andrez Niuniek Misztal (@niuniekrock), Derek Turcotte (@drkturcotte), Eliot Kohek (@eliot.kohek), Eric Rabel (@erichrabel), Liudmil Vasilev (@vasilevart), Luka Lajoie (@lukalajoie), Michael Taguet (@michaeltaguet), Mihail Kogut (@mihail_kogut), Miguel Camarillo (@miguelcamarillo) and last but definitely not least, Yomico Moreno (@yomicoart). This week features Alexis Calvié (@alexiscalvie), Boris (@boristattoo), Crispy Lennox (@crispylennox), Fabz (@fabz_art), Julien Thibers (@julienthibers), Jun Cha (@juncha), Jurgis Mikalauskas (@jurgismikalauskas), Marshall (@marshall_3rdeye), Nicklas Westin (@nicklaswestin), Yz Asencio (@yz_asencio_art) . Among the many tattoo styles and techniques, New School Tattoos are often confused with other genre’s such as neo-traditional, though they can be easily distinguished once you know what to look for. 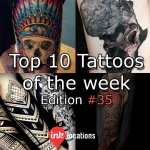 Welcome to the thirty-fifth edition of InkLocation’s Top 10 Tattoos of the week! This week features Bryan Merck (@bmerck_ink), Coen Mitchell (@coenmitchell), Darwin Enriquez (@darwinenriquez), DJ Tambe (@djtambe), Hokowhitu Sciascia (@inglourious_hoko), Jean Pierre Mottin (@jean_pierre_mottin), John Barrett (@yogi_barrett), Marcel Daatz (@marceldaatz) and Marshall (@marshall_3rdeye). 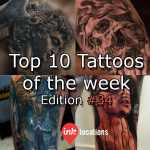 Welcome to the thirty-fourth edition of InkLocation’s Top 10 Tattoos of the week! This week features Ben Thomas (@benthomasart), Chris Meighan (@chrismeighan), Damon Holleis (@damon_tattoos), Dong Kyu (@q_tattoos), Jak Connolly (@jakconnollyart), Jurgis Mikalauskas (@jurgismikalauskas), Led Coult (@ledcoult), Noah Minuskin (@noahminuskin), Sebastian Nowacki (@tattoobylaw) and Sergey Butenko (@butenko_serik). 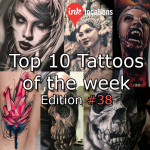 Welcome to the thirty-third edition of InkLocation’s Top 10 Tattoos of the week! This week features Daniel Rocha (@danielrochatat2), Ben Ochoa (@ben_ochoa), James Strickland (@jamesstrickland), Jeremia Barba (@jeremiahbarba), Johnny Domus (@johnny_domus_mesquita), Michael Taguet (@michaeltaguet), Ryan Evans (@ryan_evans), Ryan Smith (@ryansmithtattooist), Sam Barber (@sambarbertattoo) and Tye Harris (@tyeharris). 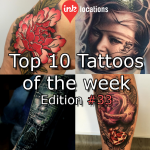 Welcome to the thirty-second edition of InkLocation’s Top 10 Tattoos of the week! This week features Benjamin Laukis (@benjaminlaukis), Beny Pearce (@tat2beny), Dean Taylor (@deantaylortattoos), Dmitriy Samohin (@dmitriysamohin), Dylan Weber (@dylanwebertattoos), Fred Tattoo (@fred_tattoo), Jean Le Roux (@jeanleroux), Jumilla Olivares (@jumillaolivares), Quang Sta (@quan9sta) and Yarson St (@yarson_tattoo).